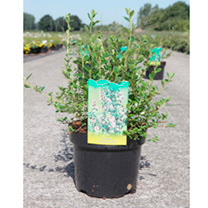 Escallonia 'Donard Seedling' is an evergreen shrub that makes an excellent hedging plant. It flowers over a long period in summer, producing clusters of blush-white flowers against dark green leaves. It copes well with being clipped, and will grow in sun or partial shade, in most soil conditions. Flowers June-August. Height 200-250cm.